DreamCream builds on SkinFood’s much-loved formula with the addition of organic essential oils of lavender and chamomile for a fresh, light and floral scent. Lavender and chamomile provide an aromatherapeutic value of calming, soothing, and stress relief, making it perfect for before bed. DreamCream is the perfect choice for those who suffer from the symptoms of eczema and psoriasis! Lavender and chamomile calm and soothe the irritation, and the rich moisturizers keep the flaky/itchy dryness away. DreamCream doubles as an excellent wound balm that is packed with vitamin E and the antiseptic properties of lavender oil. 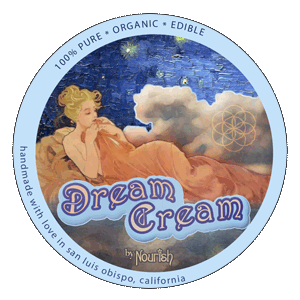 goddess tip: DreamCream is a favorite for facial moisturizing thanks to its lightweight formula and heavenly aroma.